Mighty-Mini Snap Swivels are 100% stainless steel and are 3 x’s stronger than conventional brass swivels of the same size. Smart anglers know that terminal tackle can spook wary game fish. That’s why AFW engineered this line of compact, 100% stainless steel crane swivels to be smaller and stronger than the leading brands of swivels on the market. Now you can use swivels for your rigs, and snap swivels for attaching lures, that are less visible and significantly more powerful. Mighty-Mini Swivels also have less drag and provide enhanced rotation for more strikes. For decades, crane swivels were manufactured from brass because it is a relatively corrosion resistant material and easy to manufacture. Still today, the leading brand of mini swivels continues to use brass bodies with stainless steel rings that cannot match the strength of Mighty Mini Swivels. Recent advances in manufacturing enable us to bring you these revolutionary, smaller and stronger components. Mighty Mini Swivels are available in gunmetal black finish with and without stainless steel tournament-grade snaps for the ultimate in connection protection. 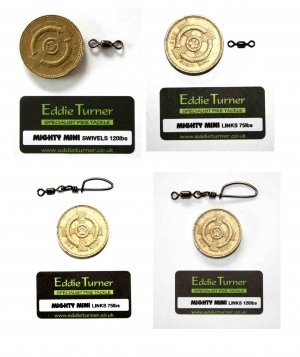 LOTS OF THE ZANDER FISHERMAN NOW USE THESE IN CONJUCTION WITH THE AFW 26lB SURFLON MICRO SUPREME. FOR THOSE FINICKY FEEDING FISH.